The victory of Ta May - Lang Vay went down in history as a brilliant milestone, establishing and laying the foundation for the Armor soldiers’ tradition of "winning victory whenever being deployed”. The victory was not only a confirmation of political and spiritual will of previous generations but also a pride as well as a strong motivation for the improvement of the Armor soldiers’ political will at present. After nine years of establishment, in the Spring of 1968, the Armored soldiers were deployed and won magnificent victory at their first battle in Ta May – Lang Vay fortifications, contributing to partly breaking the U.S – Saigon puppet regime’s strategic defensive line Route No. 9, pushing the enemy into the passivity, opportunely cooperating with other forces on battlefields of our army and people’s 1968 Spring General Offensive and Uprising. The victory was resulted from many factors; in which, the Armored soldiers’ political and spiritual will played a great role. That will was expressed first and foremost through the Armored soldiers’ desire to fight for national reunification. On October 5th, 1959, the Ministry of National Defence issued the Decision 449/NĐ on the establishment of Tank Regiment 202, laying the foundation for the formation and development of the Armored Corps. Right after the establishment, all officers and soldiers aspired to soon engage in the battles with their weapons and equipment. That aspiration urged them to devote themselves to studying, training and conducting maneuvers with the infantry and other corps through day and night. Many officers and soldiers were deployed to the Southeastern front to fight the enemy by cooperating with friendly units and using the enemy’s own tanks, thereby gradually mastering weapons and equipment, improving the skills of combined services - arms operations and the combat readiness capability. The fighting aspiration had urged all officers and soldiers to engage in the battles with strong belief, courage, steadfast will and iron determination. That will and spirit attached to every footstep of the soldiers, thereby creating “historic operation” – the longest tank-driven operation which was unique in the world’s history of war. 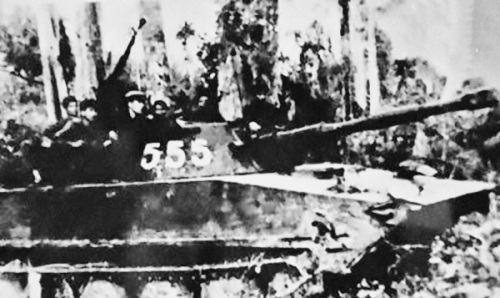 On October 14th, 1967, from Luong Son (Hoa Binh), the Tank Battalion 198 conducted a secret operation to the battlefield. It was a historic operation, because every meter of road which the tanks passed through was imprinted with sweat, tears and the extraordinary efforts of the tank officers and soldiers. It was required that the unit’s mobilization to the battlefield was in a secret manner under the principle of “go without leaving footsteps, cook without creating smoke”. They did all they could to meet that requirement, such as: putting on white cloth to guide the tanks, eliminating all traces of track, re-planting and watering the trees to keep them still alive after being crushed by the tanks, etc. Due to the dangerous mountainous route and fierce strikes by the enemy’s aircraft, the tanks were heavily damaged (the rubber part of supporting wheel was totally broken, the chain keys were abraded, the chain joggles were broken, cracked, or curved, etc); however, all officers and soldiers were still persistent and creative to overcome difficulties to continue the operation with the aspiration to soon engage the enemy. After more than 50 days and nights of going through over 1,000 km under the enemy’s heavy bombing storms and many challenging situations, the entire battalion safely reached rendezvous point. Deploying tanks to the battlefield had been tough, but winning the battle was the biggest obstacle. Although their strength had been decreased, the tank officers and soldiers were motivated by the desire to participate in the fight, contributing to the victory against the enemy. That helped them engage in the battle with the spirit of daring to fight, knowing how to fight and determining to win. The appearance of our tanks on the battlefield was a big surprise to the U.S – Saigon puppet regime. They could only calculate and predict the maneuvering capability of machines operated by ordinary people, but they could not measure extraordinariness of the soldiers who were motivated by the desire to use their own weapons and equipment to fight for national liberation and reunification. The enemy predicted that we would attack Lang Vay from the west, but we had chosen the south – “the impenetrable approach” to attack. The officers and soldiers have closely cooperated with the engineers to secretly and suddenly deploy tanks along the Se Pon river to attack mainly on the south. The appearance of our tanks forced the enemy to resist violently in a passive manner, leading to the sacrifice of some of our officers and soldiers. However, with the spirit of “the battle will go on once the soldiers are still alive and the tanks are not destroyed yet”, our tank force, along with infantry men, had brought into play their strength to raid, penetrate into, divide the enemy’s formation, and then destroy them. After 4 hours of fighting, we completely defeated the enemy, taking control of the base, winning great victory at the first engagement. The Armor officers and soldiers’ determination, efforts and sacrifice to overcome the difficulties in winning first-battle victory provided present-day generations with invaluable lessons and great spiritual momentum to follow the glorious tradition of “winning the victory whenever being deployed”, building the Armored Corps into a comprehensively strong force. It is necessary to promote political and spiritual strength of winning victory at the first engagement in building soldiers’ political will, ensuring their complete accomplishment of the missions assigned by the Party, the State as well as the Army under any circumstances. To this end, the Party committees and Commands at all levels within the Corps should focus on the following points. Firstly, to build the officers and soldiers’ faith in and absolute loyalty to the Party’s leadership. Ta May – Lang Vay victory was won thanks to the officers and soldiers’ absolute faith in the Party’s leadership, courage and desire to fight for noble goals and ideals. That is not only a great momentum to create soldiers’ political and spiritual strength, but also the first and foremost factors from which the Armor soldiers’ political will is built up at present. Therefore, it is necessary for the Party committees and Commands at all levels to well implement the political and ideological education, raise their awareness of Marxism – Leninism, Ho Chi Minh’s ideology, the Party’s guidelines and policies, especially the ones on military and national defence, mission of the homeland protection, and operational objects and partners, etc. to help all officers and soldiers thoroughly understand their missions and keep their faith in the Party’s leadership. The education of tradition should be implemented effectively to make the great historical values of winning victory at the first engagement clearly perceived by the officers and soldiers, creating momentum to urge and nurture their own honor and pride, thereby building responsibilities and desire to preserve and promote that tradition during their mission accomplishment. Besides, all agencies, units and schools within the Corps as well as the Armored forces subordinated in the entire Army need to promote the training quality under the slogan of “fundamental, practical, and solid”, paying attention to making training programs relevant to reality, missions, areas, and adversaries, ensuring the soldiers’ thorough understanding and mastery of weapons and equipment, operational plans and adversaries. As a result, that helps equip them with brave fighting spirit, and confidence in dealing with situations. Importance should be attached to propagation and education which help build the soldiers’ faith in our way of fighting, weapons and equipment and show the decisive role of human factor in the battles, equipping soldiers with strong will and spirit of “daring to fight, knowing how to fight, determining to win”, being ready to fight and win the victory when the war breaks out. Secondly, to promote the spirit of overcoming difficulties, cooperating with one another, and collectively achieving the feat. Nowadays, along with social multi-dimensional affects, the Armored soldiers’ daily activities are taken place under hard conditions such as: strength-consuming working environment, making them vulnerable to career-related diseases, poor-quality weapons and equipment, etc. Therefore, it is essential to continue the introduction and promotion of the significance of the historic tank-driven operation as well as the fighting will to each officer and soldier in order to encourage them to overcome hardships, actively study and train to fulfil their assigned missions. Thirdly, to improve the self-immunity of the soldiers in order to fight effectively against "peaceful evolution" trickery and plots of hostile forces. In the face of the explosive development of science and technology as well as the hostile forces’ acts of sabotage, in order to equip the Armored soldiers with strong political will and absolute confidence, the Party committees and Commands at all levels should place their leadership and direction on the comprehensive implementation of the officers and soldiers’ propagational and educational measures which help them clearly perceive the trickery of "peaceful evolution", "the depoliticized Army" as well as the plots of hostile forces, and then actively fight to lead all of their plots and acts of sabotage to failure. Regular grasp of the situation is required to opportunely provide information, ideological orientation for officers and soldiers, especially in the face of complicated and sensitive events. The pride and respect for the heroic tradition “Winning victory whenever being deployed” as well as the enhancement of the value and strength of political-spiritual factor in winning first-battle victory to improve officers and soldiers’ political will are important components that need to be properly perceived, contributing to making the Armored Corps strong, creating new momentum to excellently accomplish its assigned missions. 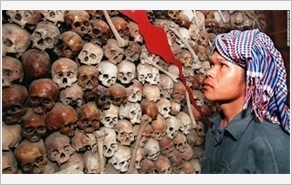 1 – In the victory of the first battle, the Tank soldiers were supported by Pa Ko and Van Kieu ethnic groups in Huong Hoa district, Quang Tri province; especially the people in Thuan commune kept the camps secret, scouted the enemy’s situation, used dug-out canoe to transport artillery shells, batteries of tanks, etc.